Our life changed on the 9th of May 2017. The day was going quite well, work had been okay, it was sunny without being too hot, it was a nice day. I called my wife on the way home to ask if anything had happened, if she’d felt any signs that might suggest our baby was on the way but no sign – again. Excitedly I went home, fed the cat, picked up the pyjamas and suitcase and was out the door in five minutes. At least I would have been had the ‘phone not rung. ‘Where are you?’ My mother in law. ‘What’s wrong?’ a whiff of panic. ‘We’re setting off, meet us on the way’. I met them near my in law’s and it was clear things were indeed moving fast. We swapped cars and drove like the wind to the hospital. We just didn’t make it. Angus was born in a cloud of panic and confusion in the fast lane of the A120. We screeched to a halt in a petrol station as Jess said over and over again ‘why is he not making any noise?’ and then started to scream. I phoned the ambulance and followed their instructions to give CPR for the ten minutes until they arrived. The first crew whipped Angus away. We’re told they were doing 120 mph on the way to the hospital. Another ambulance took me in as my wife was seen to by yet more paramedics and then at Colchester General Hospital, having expected the worst we received the second incredible shock of the day. For the first three days Angus received cooling treatment where his core temperature was lowered to 34 degrees. Then came the problems of taking him off the ventilator, then the meningitis scare and the lumbar puncture. Every day there has been something new, something scary, something completely life changing. 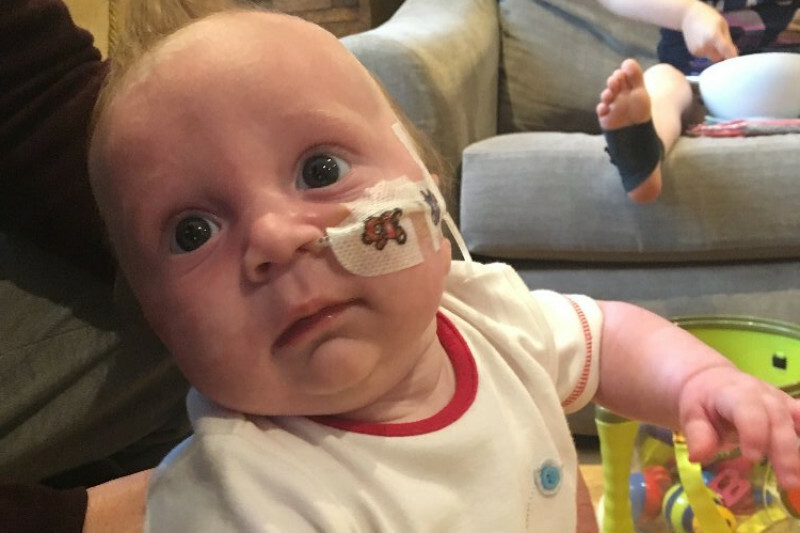 We were in Addenbrooke’s for three weeks – staying with the help of the Sick Children Trust – before transfer to Colchester General Hospital all the while adjusting slowly to the new reality of having a disabled son. Angus is now home and we are attempting to get back to something like normal but although he is making terrific progress it is increasingly clear that Angus has Cerebral Palsy. We do not have a full diagnosis yet but he has, as the doctor said, by definition got some form of Cerebral Palsy. He was without a pulse for at least 30 minutes and has been defined as having Hypoxic-Ischemic Encephalopathy (HIE) grade three. This is of course the most severe grading for oxygen starvation there is. Opinions have varied wildly as to his future. We’ve been told he will not eat, we’ve been told he can eat. We’ve been told he will not move, we’ve been told he will do really well. And yet here is the problem. Essentially he has potential IF we put in enough early intervention and although they have been brilliant so far the NHS simply cannot provide physiotherapy with the frequency he requires. We’re soon starting additional physio classes at £75 an hour, and have fortnightly chiropractor sessions at £50 for a half hour. And then of course there is the feeding situation. Angus is still fed through a feeding tube and we have recently had to attend a £500 an hour consultation to assess his capacity to feed. One of the best clinics is in LA. Another intensive course in London at £3,000 for a two week intensive course. In every area Angus requires more support than the otherwise brilliant NHS can supply and you can see it is excruciatingly expensive. All at a time when Jess is on maternity leave and may not be able to return to work. The fact is Angus needs help and we have realised we need to raise a lot of money to give him the help he needs. He is making such amazing progress in some areas. He looks intently at every person in a room, loves a bath and trips to the sensory room when we return to hospital. Angus is an incredible boy who has amazed us all so far. We want to give him every opportunity to continue to surprise us. I don’t think we could live with ourselves if we didn’t give him a chance, but that chance just costs lots and lots of money. This page is a starting point for us to give information about our fundraising efforts which will develop over time. Thank you for visiting and thank you for your support. Oh my goodness. WOW. You are the most amazing people. Over £6000 in seven hours! You are potentially giving this child his future back. Thank you so, so much. Please do everything you can to spread the word. We'll include updates on the facebook page of how your money starts to transform Angus's future. We'll try to send individual messages to all donors in the next few days but until then THANK YOU!!! Amazing. Two hours after I opened the donations we have £1700. Thank you so much. Please keep sharing the link to the donation page so that we can give Angus the future he deserves.